Modern steel frame construction for buildings of all sizes has led to a boost in the industry, delivering quality results that are meant to last a lifetime and beyond. Your project relies on the durable and versatile benefits of structural steel, but the results are only as good as the materials and processes used during construction. Steel structure building can be an intense process that relies on precision and innovation to get the job done. Hiring a team of inexperienced steel erectors for your Michigan project can prove to be a disaster, so be sure to contact Sanilac Steel to learn about our quality services before you break ground. Since 1967, our steel fabrication and erection team has worked diligently to deliver the best results to clients all across the state. Our steel construction experts have the equipment and expertise to work as expeditiously as possible to cut costs while improving safety and efficiency. We’re dedicated to delivering the best results for projects of all sizes, with our steel construction company’s experience to help every step of the way. We’ll work one-on-one with you to ensure that your steel erection demands are comprehensively met. This can be very beneficial on projects with exacting requirements and rigid design specifications enforced by quality assurance. 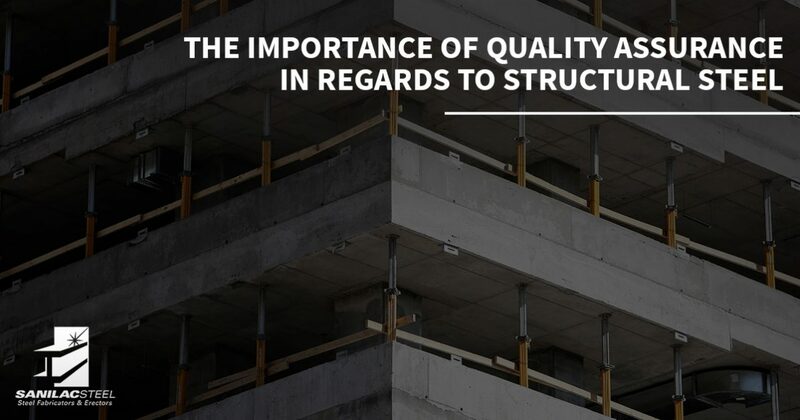 Read on to learn about the value that QA ultimately provides for your structure. As the name implies, the purpose of QA is to directly assure the quality of your structural steel erection services. A trained individual will arrive as a third-party to inspect the results of any vital construction done. Steel is an amazing product, but it is only as good as the accuracy and quality of its installment. QA helps to bring fresh eyes in that are trained to look for any deficiencies in quality. The agent sent to inspect your site will be specially trained to check that all of your materials and services meet all specifications. The steel arriving on your site needs to adhere to strict design specifications to ensure a safe and long-lasting outcome once the project is completed. In many instances, this consists of checking the material composition, as differing carbon levels can lead to vastly different steel characteristics. Steel fabrication and erection relies on precision at all levels, making it essential that you have the right materials on hand to meet design specification requirements. Utilizing a material that doesn’t meet design specifications can be costly, inefficient, and dangerous. Our steel contractors will work with your appointed QA to ensure that all materials used on-site are correct and ready for use. Personnel in the construction industry rely on the best tools and machinery to get the job done safely and effectively. Quality assurance expands to equipment inspections, as small problems with the tools can result in costly repairs later on. All equipment should be inspected regularly for optimal safety, but remember that minor tool imperfections have the potential for big problems. If your welding tools aren’t working properly, the integrity of the entire structure can be compromised. Quality Assurance strives to prevent complications by performing inspections of all relevant equipment. The theme you will see throughout this blog post is that the amazing benefits of steel can only be as qualitative as the installer’s abilities to get the job done. Even if the equipment used is the most modern available, the results will be for naught without a skilled pair of hands. Structural steel has come a long way over the decades, but the material can only be as good as the person crafting it. Quality assurance is vital when it comes to checking the qualifications of steel workers on the site. Welders must be licensed and qualified to handle the job, as this point in construction can make or break the overall strength of the building. Precision is a keyword in the steel industry, as your steel products need to be sized to their exact design specifications. Even a millimeter difference can create a big problem across large spans! The fit of your structure will play a large role in the quality throughout its lifetime. It is essential to find a team of structural steel fabricators that can provide exacting results day-in and day-out. Otherwise, your QA person will be coming to you with a list of costly repairs! Sanilac Steel is proud to be your trusted steel erectors in Michigan, delivering top-quality results each and every time. Our team relies on proven practices and stringent training to provide your site with honest, reliable, and safe steel services. Contact us today to learn more or to receive a quote for your project!